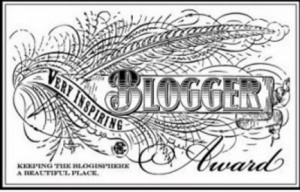 unusual death | Buried words and Bushwa. Somewhere out in a paddock in Moss Vale, N.S.W. there is an embarrassed ghost just wishing it had suffered a more dignified end. 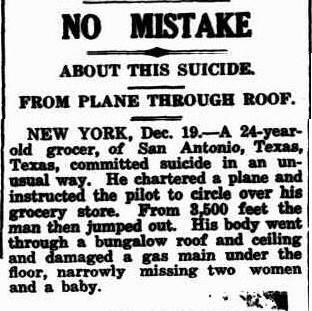 In 1932 a bullock was found dead under strange circumstances. It seemed that the bullock had an itchy head and, as quadrupeds do, lifted a rear foot to scratch it. Unfortunately, the bullocks demise was attributed to being suffocated when it couldn’t extricate itself from this position, the hoof becoming caught on a horn. 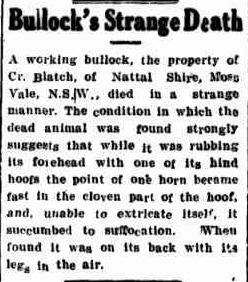 Yes, I know we shouldn’t laugh about an unfortunate end like this but I really would love to know what went through the bullocks mind when it realized its own foot was stuck on its head…. A lion tamer worried. 1894. This is a job that is not as popular as it used to be, isn’t it. Lion tamer. People these days want to see happy lions on the telly, eating a less than happy antelope, not a whip brandishing lion tamer with a group of cowed big cats. I wonder how long the lions in this article were plotting the demise of their tamer, Thieman? They obviously jumped at the chance to have a go at him when the lights went out. Being stuck in the dark on the wrong side of the bars with a group of excited predators you had recently forced to do tricks would probably be a lion tamers worst nightmare. I love the way they have used the term ‘worried’ in this article. We know what it means when a dog worries at something but when we hear that word the idea of concern or anxiety springs immediately to mind. 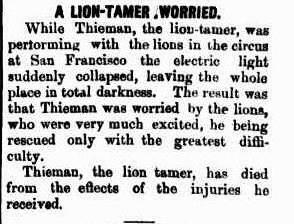 The title of this article ‘A Lion Tamer Worried’ is probably exactly what he felt in those first seconds, just before the real worrying began…. 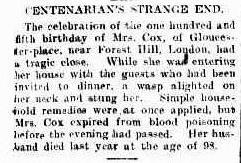 I haven’t had an unusual death post for a while so here is the unexpected end to the long life of Mrs Cox, felled at her 105th birthday party by the sting of a wasp. I wonder if it was blood poisoning or, more likely, an allergic reaction. 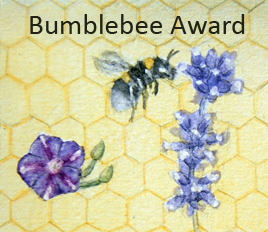 Had she made it all the way to 105 without ever being stung before? 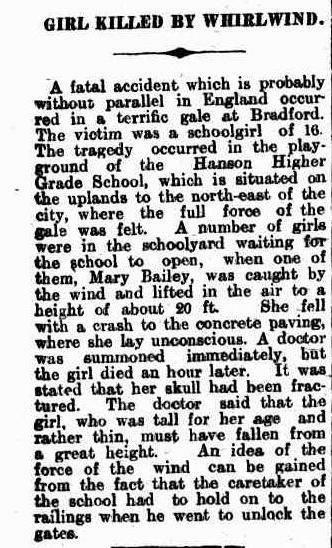 I wonder if in 1907 it was less likely to reach the age of 105 or to be killed by a wasp? 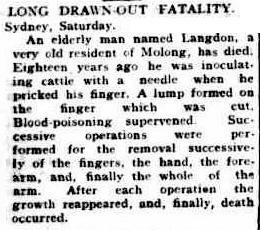 Poor Mr Langdon. It certainly was a long and drawn-out death. Eighteen years. Doesn’t sound like he was on his deathbed the whole time though. You can look at it from the angle where he could have died earlier from falling under a cart or being eaten by a shark or some other unexpected end that can befall any of us at any time, and say he had a pretty good life anyway. Eighteen extra years of life, even if he was slowly losing his arm with each bit of surgery, is better than being a sharks dinner or falling down a mine shaft. I wonder what the recurring lump actually was? If you hate your job, you should just quit. Extreme measures. 1936. What an unusual way to hasten the end. If you hate your job you should really do something a little less drastic about it. I wonder what the pilot was thinking as this guy dove out? I wonder if it was his own shop or if he had spent ages just dreaming about smashing through the roof onto his surprised boss? I am sure we have all imagined ways to tell a crappy boss to shove their job, but diving through the roof from 3,500 ft? Really? I think he could have thought that through a little better. Either way, it would appear he missed the grocery altogether and only managed to ruin a nearby bungalow and nearly take out some innocent bystanders. Those poor women are never going to feel safe indoors again! It is not unusual to find articles about rains of frogs, showers of stones or other things that don’t usually fall from the sky. These phenomena are generally blamed on wind events sucking the creatures or items up from one place and depositing them somewhere else. This doesn’t explain why these surprising showers are so selective, surely a shower of frogs would also be a shower of pond weed and smelly water too. A rain of blood (usually a mix of airborne dust and plain old rain) should really be accompanied by detached body parts and weapons. I mean, where would a wind find a large puddle of blood just lying about, waiting to be sucked up, except on a battlefield or suchlike? Anyway, you don’t get that many actual witnesses to these things falling from the heavens. Usually it is more a case of ‘there are many strange frogs in my garden, they must have fallen from the sky! !’ rather than ‘ouch, where did that come from? !’ It is even less likely to find someone who really saw the sucking-up bit at the start.